BUT WHAT MAKES TAWINGO UNIQUE? The reality is that there are many, many camps from which you may choose. What is it that makes Tawingo unique? What makes Camp Tawingo so special that we have families that have been sending campers for multi- generations? Why are our alumni events always filled to capacity? We invest our energy and resources in the development and training of our staff – rather than in the latest camp gear and gadgets. For us, it is about ensuring our staff are exceptional at connecting with children and helping them to connect with one another and the Camp experience. Our staff return rate is exceptionally high. Over 95% of our staff have been campers at Tawingo themselves and wish to provide to our current campers the same sort of wonderfully positive experience that they themselves enjoyed over their many years as campers. They do not need to be taught our philosophy because they have grown up with it. Our staff believe in a camper-centered approach to leadership and are chosen for their desire to be with children and help them to grow in the Camp experience. We intentionally avoid buying into the latest in camp gadgets. We have found that the gadgets can promote a culture that revolves around line-ups, and concerns over when it will be 'my turn'. We believe that it is infinitely better to have campers spend their time doing something fun, creative, and constructive with one another; and would much prefer to call upon the creativity and experience of our staff to create programs that truly are unique for our campers. 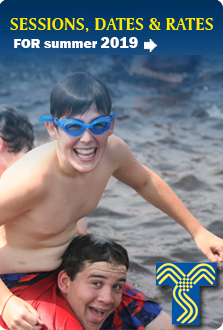 These programs, unique to Camp Tawingo, take the form of active/wide games that counsellors of a particular age group organize for the campers in their age group. Often they are tied to some great theme like Harry Potter or the Olympics, and they are full of amazing costumes and great little twists to old games like "Capture the Flag". These are the sort of things that just don't happen at home, games that you just don't see in the park or on the school playground that our campers really LOVE to play, and that our counsellors really LOVE to plan and play. Our campers consistently rate these experiences as one of the best things about Camp, and may not even notice how much they have learned about co-operation, fair play, team work, and leadership in the process. With guidance and encouragement from their leaders, campers make their own choices each day about what they wish to do for Interest Groups in the morning and their Supervised Free Time throughout the day. 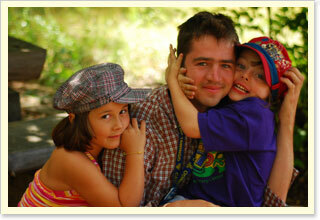 Campers may choose to do activities with their cabin-mates or friends from other cabins and age groups. Campers are encouraged to explore their interests and experience everything that camp has to offer. At Tawingo we strive to recognize the individual by providing campers with opportunities to follow their own interests. 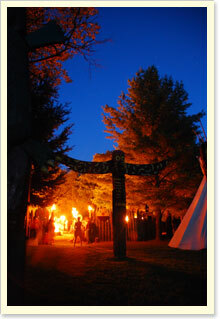 This, in conjunction with all the group activities they do, creates a well-rounded experience for all of our campers. One of our goals is to provide a self-contained environment in which campers are safe to engage in both organized and self-directed free play. This summer oasis is a place where campers can leave the distractions and pressures of city-life behind. Camp Tawingo does not allow campers to bring personal computers, music players, cell phones or junk food to Camp. We have consistently found that campers embrace the Camp experience more quickly and more fully when not “connected”, and indeed, don't even miss these devices once they settle into the rhythm of Camp. 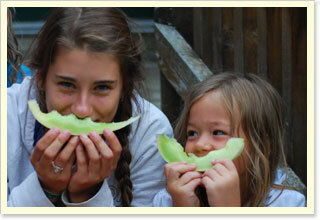 Food at every meal is served family style on platters; campers eat with their counsellors at a family-style tables. We try hard to create the feeling of a Sunday evening family meal at every meal! Campers take turns bringing trays of food to and from their table, scraping plates, and clearing the table. During the meal campers pass the food around the table. The resulting congenial environment encourages campers to be thoughtful of the needs of others sitting at the table with them.
" I made lots of new friends and had a ton of fun! My favourite memory was on outtrip. We had a blast. Gracie was a really great counsellor. Thanks for a great two weeks at camp! "